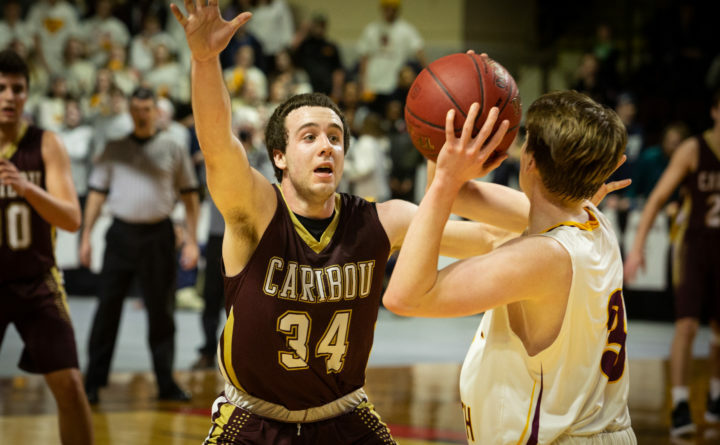 Caribou High School senior Austin Findlen (left) plays defense in the state Class B basketball championship game in Portland on March 2. Findlen promised his grandfather, who died in January, that his team would win a state title. Many of the top high school basketball players in northern Maine gathered on the court one final time on Wednesday night for the 29th Aroostook County Senior All-Star Games in Caribou. In the boys game, Team Gray rode 18-point performances by Austin Findlen of Caribou and Nick Brewer of Houlton to a 119-92 victory over Team Red. In the girls contest, Ashlee Harris of Central Aroostook tallied 18 points as Team Blue downed Team Pink 54-41. Proceeds from the games benefit the Aroostook League Scholarship Fund. Last year, the Aroostook League presented $4,000 in scholarships to graduating student-athletes. Brewer and Findlen spearheaded a balanced and deep performance by Team Gray in the boys game. Isaac Potter of Greater Houlton Christian Academy, Jayden Burpee of Southern Aroostook in Dyer Brook and Sabre Phelps of Woodland scored 14 points apiece for the winners. Gavin Gardner of Woodland chipped in with 12 points. Ben Thomas of Central Aroostook in Mars Hill scored a game-high 20 points, including six 3-pointers, to pace Team Red. Caleb Delisle of Fort Kent netted 14 points and Jonah Hudson of Presque Isle added 13. 3-pt. goals: Thomas 6, Currier 2, Delisle 2, Tri. Cyr 3, Hudson 3, Tuttle; Findlen 4, Potter 2, Brewer, Porter, Gardner 2, Hand 2. Ashlee Harris of Central Aroostook scored a game-high 18 points to lead Team Blue to a 54-41 victory in the 29th Annual Aroostook County Senior All-Star Game played Wednesday in Caribou. Kassidy Mathers of Southern Aroostook added 11 for Team Blue. Leah Gendreau of Van Buren led Team Pink with 13, with Alyssa Banville of Wisdom pitching in with 9.